“The desert of irrevocable death”. This is the meaning of the word Taklimakan in the Uyguri language, a population that lives in extreme conditions on the border of the desert. To them, even from the age of Marco Polo, whoever goes in would never come out. 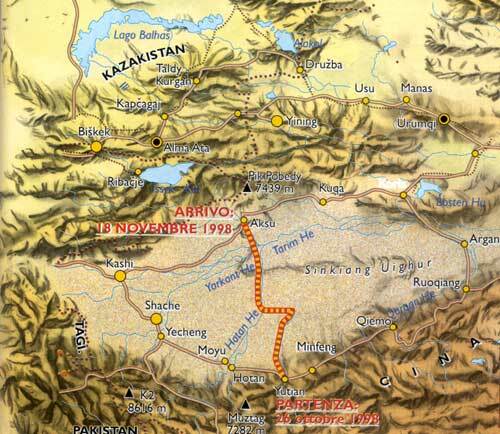 In fact none of the numerous caravans that for centuries have traveled on the Silk Road ever crossed it. The desert is located at north west of the country in the middle of a depression, surrounded by the Himalayan Mountains. 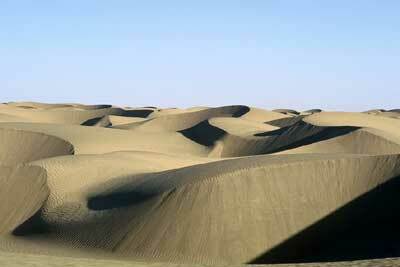 It is considered the second biggest inhabitable desert in the world, after the Sahara. Carla decided to try her most difficult challenge: with a backpack weighting 24 kilos and alone, she wanted to try crossing it on foot, from the south side to the north side. She would be the first person in the world to do it. She left from a small town called Seghez situated on the north of Yutian on the southern part of the Taklimakan, on October the 26th, assisted as always by her husband and a support team. In her backpack, besides the ultra light tent weighting only 900 grams, the sleeping bag and the cooking equipment made of titanium, there were few high-tech clothes, a digital video camera, a photo camera, and a small tripod. Tied to her chest there was also a heart monitor to survey the physical strength of the athlete. 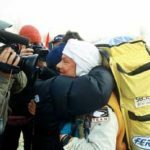 She kept in touch with the base camp through a satellite phone, weighting two kilos and half powered by a solar panel tied to the top of her backpack. To save more weight she ate only pills and dried high-energy products (the same ones used on space missions) and had to take 27 pills a day. 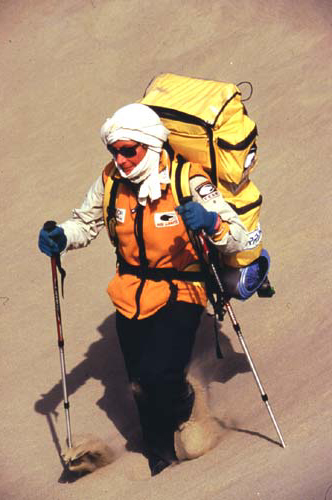 The total backpack weight was 18 kilos with an additional six liters of water. 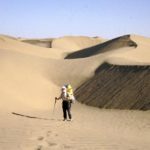 During the first part of her trip, Carla walked in the dry bed of the Keriya River, which is one of the Ghost Rivers that crossed the desert in the period of the big glaciers melting and she hoped to find some water puddles to refill her supply. Sometimes the water was undrinkable because of the high salt concentration, which made her diverge in another direction to find the precious liquid. 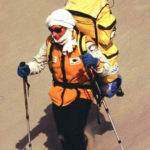 As always she carried a GPS to track her direction which she checked every night before sending it by satellite phone to the base camp that was following her from about 80 kilometers away. 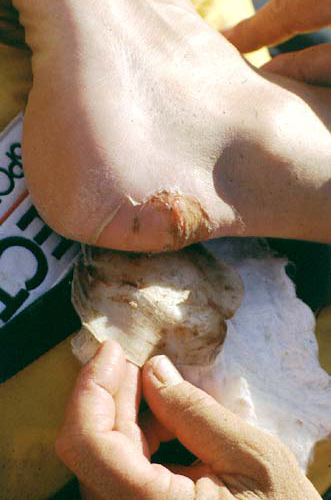 After just few days, a terrible blister on her heel almost made her quit, but luckily in the small Daheyan oasis she found a pair of Chinese shoes that helped her to continue her journey. 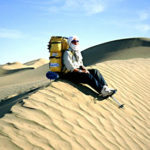 She walked for 150 kilometers before arriving in the unexplored and hardest part of her challenge. 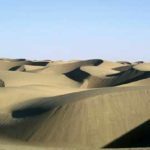 ” In front of me I can see the immense stretch of big sand dunes so beautiful, leaving me breathless: I ask silently to whom is following me from above to give me the strength to keep going, Then out loud I talk to the desert. “Please, let me by you”. Between the dunes there is no water. 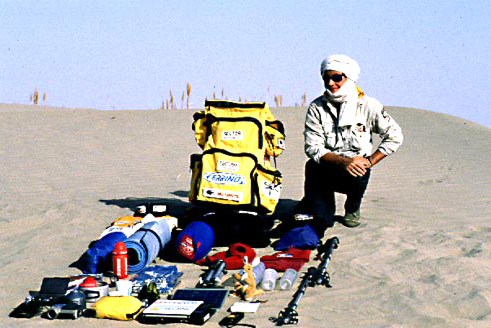 After Carla departed, her assistant friends with a caravan of camels, went into the desert to leave her four water re-supplies each of six liters, that she would have to find following the direction on the GPS and the coordinates given on the phone.During the entire duration of the trip she did not have any physical contact with her base camp, and if she would have missed just one supply leg, she would have had to quit. The water consumption was relatively low due to the low temperatures (from a maximum of 35 degrees during the day to a minimum of – 12 degrees at night). 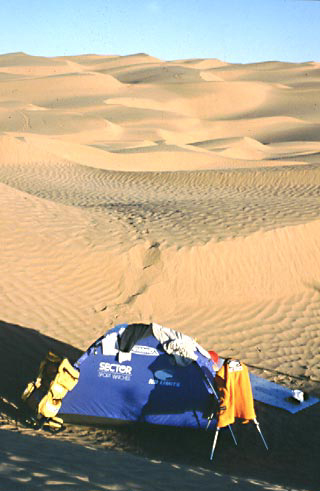 The worst enemy of Carla’a was in fact the cold temperature during the night: in the small tent everything became icy and the long 12 hour Chinese nights became a nightmare. 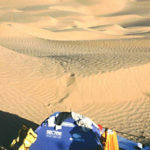 For a week she walked up and down from dunes measuring more than hundred meters, similar to big waves in the ocean 360 degreases around, with the support of just a pair of sand rackets and without ever meeting any life forms, and she reached every supply station. 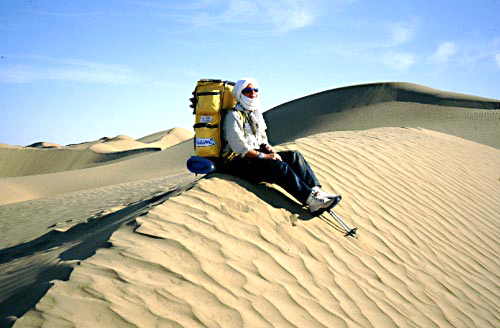 After 270 kilometers, Carla arrived at the Mazar Tagh Mountains, the end of the most dangerous part of the challenge. 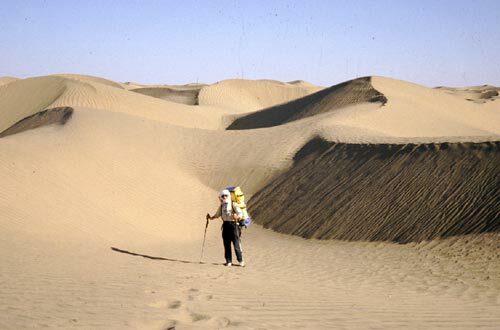 She was able to find the dry bed of the Hotan, another river and she found small water puddles in which she could collect some water after breaking the ice on the surface.She still had to walk for 280 kilometers in an environment full of monotony and against the temperature which kept dropping lower and the icy wind that was following her: the water needs went down to one and a half liter a day. 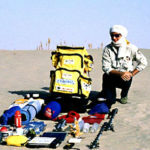 On November 18th after 24 days and 550 kilometers of complete loneliness she arrived at Luo Tuan, a small town located on the northern side of the desert by Aksu where she successfully ended her crossing.Waiting for her was her husband, the full support team, the Chinese television and several reporters. Also with them there was the father of a Chinese kid who gave her some pictures of his son, who had died the year before trying to cross the Taklimakan. With her backpack still on her shoulders, Carla went down on her knees toward the desert and saluted it. In the sand during her last night of camping she buried a small box with a love and thanks message for the Taklimakan that gave her the permission to realize her dream.